Today’s recipe is very special one for me. Because this is the famous Chungmu Kimbap (충무김밥) from my hometown. 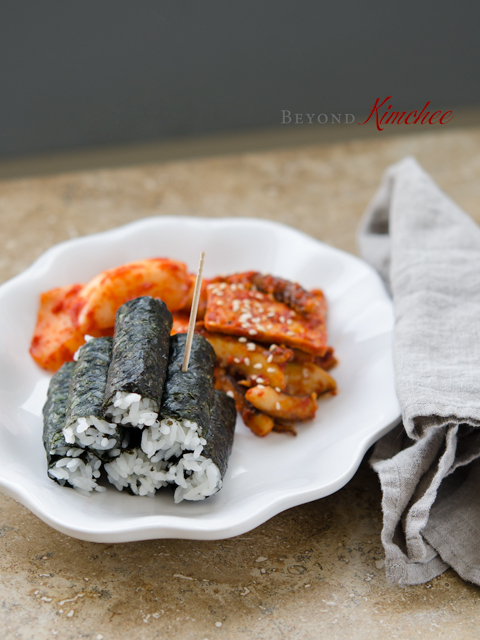 Most foreigners who enjoy Korean food provably tried Kimbap, the seaweed rice rolls stuffed with various vegetables. 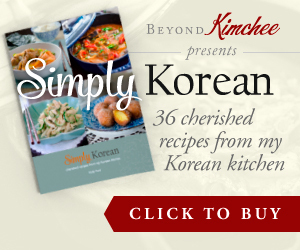 I bet not many of them have tried or even heard of “Chungmu Kimbap” though. 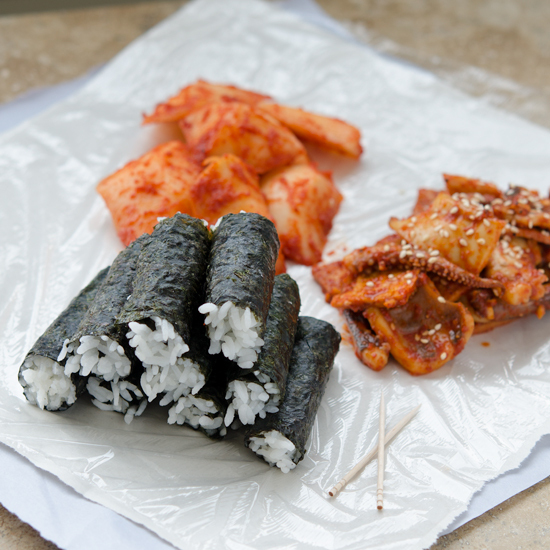 Chungmu Kimbap is popular seaweed rice rolls among local Koreans. There are many franchise restaurants in Korea that specialize this particular kimbap. Chungmu Kimbap is dear to my heart because it is the food from my hometown, Tongyoung, one of the most beautiful harbor town of south Korea. Tongyoung was once called Chungmu, where the name of the dish originated. 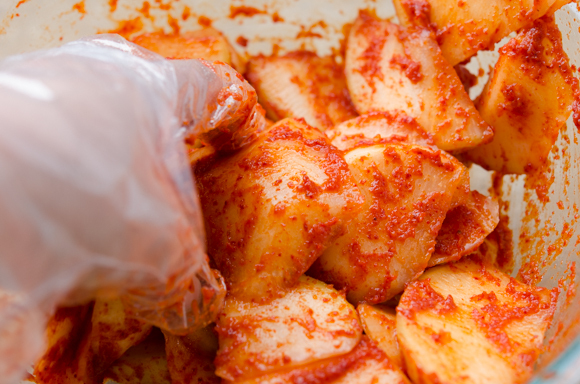 This local delicacy became quite popular 1988 around the time Korea hosted Seoul Olympics. We no longer saw the fat granny in the ferry terminal since then (In fact the ferry terminal is not there anymore, either). 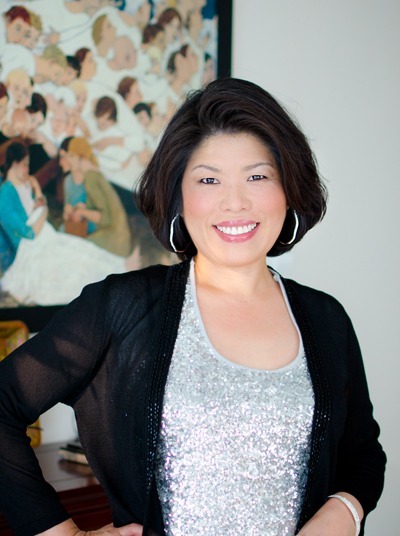 With many franchise offer she got, she became very wealthy. Although she passed away many years ago, her daughter-in-law continued the business and you will see her restaurant across the street where the ferry terminal used to be. 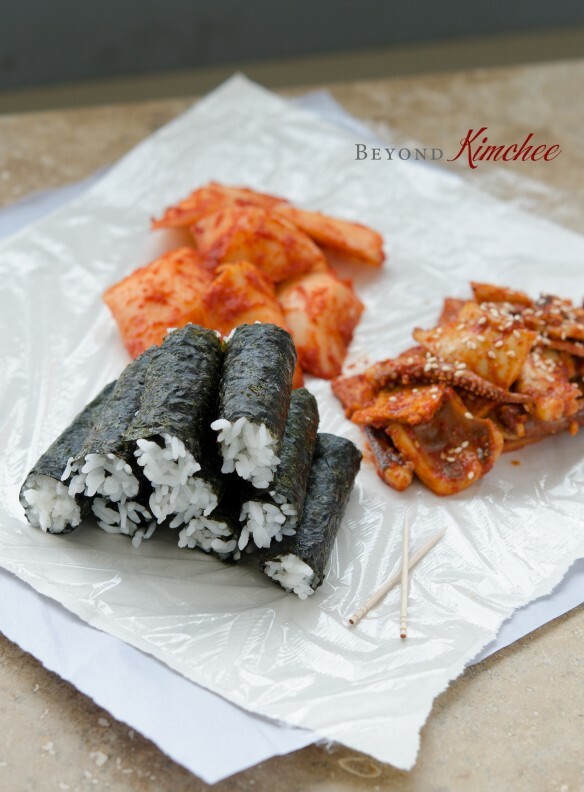 There are several other restaurants that specialize Chungmu kimbap along the same street. In fact some people believe that the fat granny is not the one who created the recipe. It was known that one unknown fisherman’s wife came up with idea after many incidents of her traditional kimbap she made for her fisherman husband’s lunch got spoiled easily while he is on the sailing, so she created kimbap without the filling. She wrapped the plain rice with seaweed into bite size pieces and put the side dishes (radish and squid) on the side instead. She wrapped the kimbap in plastic coated papers and a couple of toothpick to use as an utensil. It worked! The kimbap stayed fresh longer even during the hot season. Since then many fisherman’s wives tried that method and became the tradition of Chungmu. Funny thing is some local Chungmu people don’t consider the fat granny’s kimbap as an original. But whether her recipe is original or not, it is true that she was one of the most well know person from my hometown, and perhaps I will be the next…? Just kidding! If you see my Tongyoung post that I wrote a couple of years ago, you will find many other attractions why this harbor town is so famous among Koreans. As for the recipe, I can’t nail it down to be exactly the same as what you would get in Tongyoung, but it will be better than what you would get in Seoul in one of those copycat Chungmu kimbap franchise restaurant. Cut the radish in a free form, 1/2″ on the thickest part. Soak the pieces in salt, sugar and vinegar solution for 2 hours. In a blender, puree onion, garlic, and anchovy sauce until smooth. Reserve 2 tablespoon of the puree. 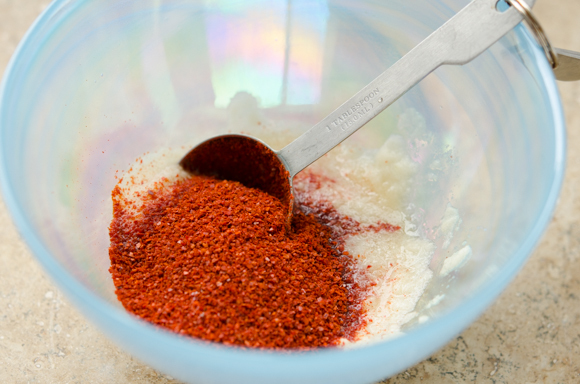 In a bowl combine the onion puree (except the reserved 2 tablespoon) and plum extract (if using), and mix well. Drain the radish and mix with chili seasoning. Toss well. The radish side dish is done! Making this 1 day ahead and let it sit on the counter to ferment would bring a nice flavor. Move on to the squid side dish, usually the original chungmu kimbap uses semi-dried squid but it is hard to find that outside of Korea, so I use fresh squid. Besides I am not taking this as a lunch for my day long fishing trip. My husband will say “Yikes!” if he seeds this image of squid. He hates squid but his wife loves it! No matter what, we get along very well. Cut into big pieces and blanch in a boiling water for 30-60 seconds. Be careful not to overcook. Otherwise they will get very tough. 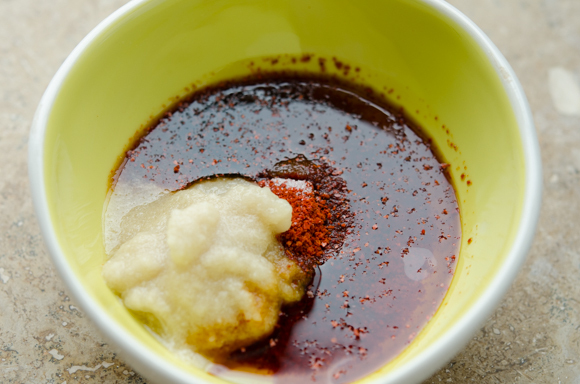 Combine the reserved 2 tablespoon of onion puree with soy sauce, chili flakes, sugar, plum extract(if using), pepper, and toasted sesame seeds, and sesame oil. Set aside. Combine squid, diced fish cakes, and the seasoning. Toss well to incorporate everything. The squid side dish is done! 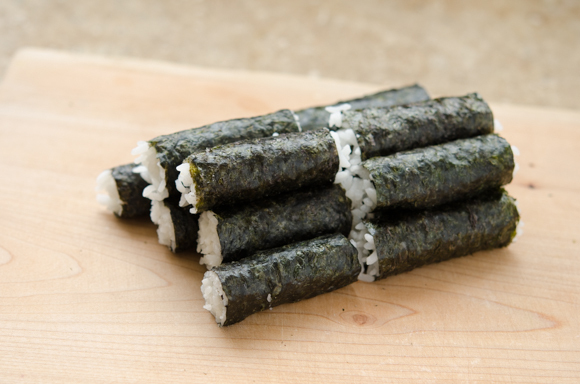 Cut the seaweed into 6 segments and spread a little bit of plain rice over each piece. Roll it up and there we go! That’s all! They might seem nothing special, but it is so good together. I would prefer to eat this kimbap over other kinds of kimbap 9 out of 10 times. This brings me so many memories of my childhood and the scenery of my hometown. For some unknown reason this tastes better when you use a toothpick rather than a folk or chopsticks. For me this is a kind of food that I can eat everyday and I won’t get board easily. Yum! Peel the radish and slice it in free form to get ½" on the thickest part. 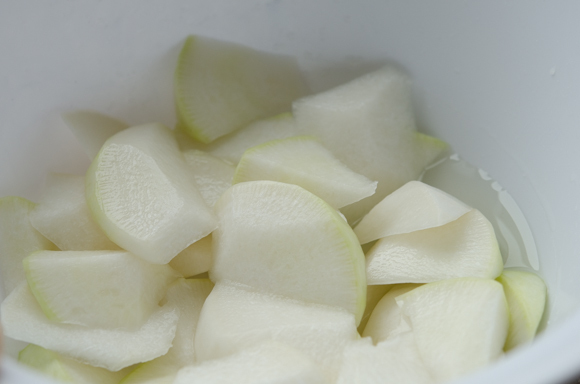 Dissolve salt, sugar, and vinegar in a bowl and soak the radish slices for 2 hours. Drain well. Set aside. 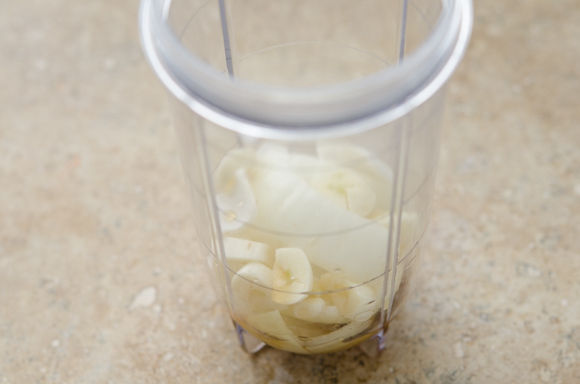 In a blender, puree garlic, onion, and anchovy sauce together until smooth. Reserve 2 tablespoon of the puree. To make the radish side dish, combine the onion puree (except the reserved 2 tablespoon) with the rest of the radish ingredients. Mix well. Toss with the radish. Let it sit on the counter for a day to ferment if the permits. 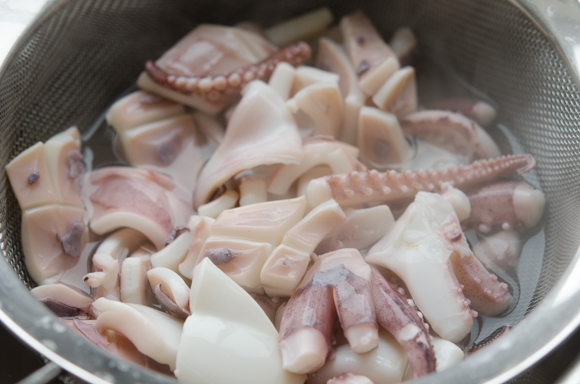 For the squid and fish cakes, blanch the squid in a boiling water for 30-60 seconds and drain well, place on a mixing bowl and set aside. Slice the fish cakes into desired bite size. Add to the squid. In a small bowl combine the remaining 2 tablespoon of the onion puree with the rest of the ingredients; mix well. 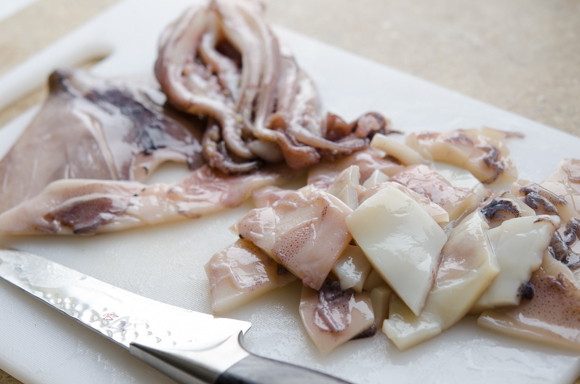 Pour the seasoning into squid and the fish cakes and toss well to incorporated everything. 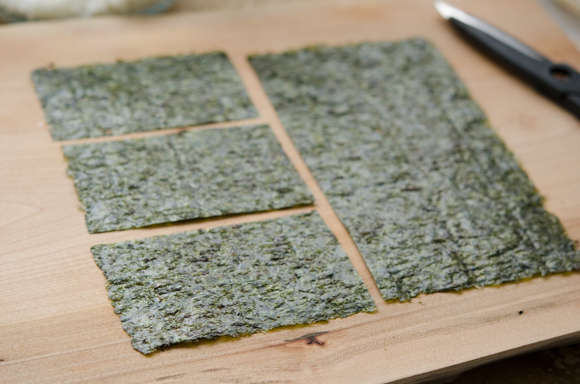 Cut each sheet of seaweed into 6 equal segment. 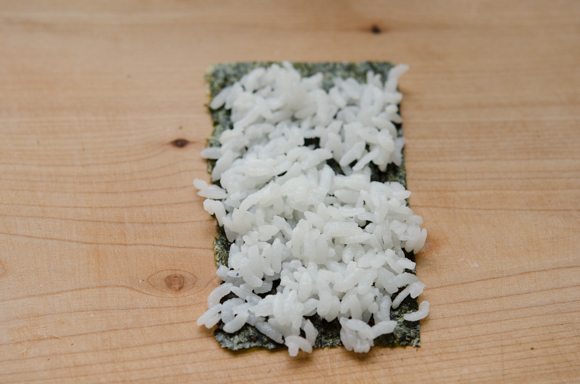 Spread a little bit (about 2 tablespoon) of rice over the seaweed pieces and roll it up. Serve the seaweed rice rolls with the 2 side dishes. 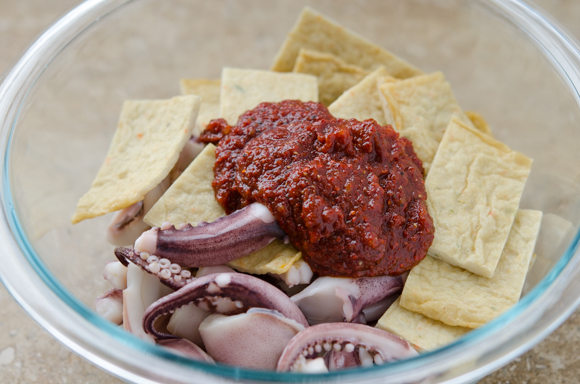 Hi Holly, I love that spicy squid idea. And a super good balance for the clean rice roll and excellent spicy squid. It does indeed make great balance between the seaweed rice rolls and the squid. Thanks. Love the fat granny story! And love these -- terrific looks, and I'll bet the flavor is awesome. Thanks, and I hope you have a happy weekend! Thanks, John. I hope you have a great weekend, too. It is fun to make, too. Hope you get to try it. I love kimbap! I am craving these and many others of your wonderful dishes right now! O that looks wonderful, but than I find all your recipes look very tempting. I so need to get more into Korean food! I really enjoyed your story! Thank you so much for sharing Korean history, so interesting. Thanks Judy! I am glad that you enjoyed the story behind this dish. So surprised to know that you are from Chungmu! My mom grew up there, and my grandma still lives there! I love Chungmu and their food. Whenever I go there I would go to the street where you see all the kimbob places claiming that they are the original. Haha. Thanks for the recipe!! Jiyeon-ssi! So happy to hear from someone who are related to my hometown. May I ask which part of Chungmu she grew up? I might know her depends on the area. Hope you get to visit my site often. Have a great day!